A Brief Description big green creatures, mana ramp, card draw. i try to have fun and sit back looking innocent mana ramping and mass card drawing then i play big fatties and my commander. in a 4 player game he can easily be a 25/25. Predatory Focus , Triumph of the Hordes , Bellowing Tanglewurm , Akroma's Memorial , Nacatl War-Pride , Nylea, God of the Hunt , Void Winnower , Stonehoof Chieftain , and Siege Behemoth are all my wincons with my commander. Overwhelming Stampede , Praetor's Counsel , and Genesis Wave are all my win more win cons. 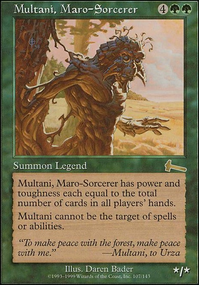 With Traverse the Outlands , paired up with my Multani, Maro-Sorcerer In a 4 player game is absurd. you can easily get all the forest in the deck out onto the battlefield. Works with Realm Seekers too. 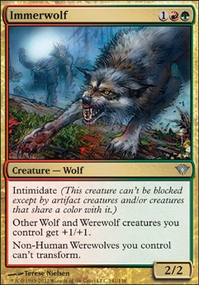 All creatures like Artisan of Kozilek to Wolfir Silverheart , work great with Garruk, Primal Hunter 's second ability. Garruk with my CMDR Multani, Maro-Sorcerer or Realm Seekers can get you 20 or more cards easily. Whisperwood Elemental is board wipe recovery method. Use Soul of New Phyrexia 'S ability to stop a boardwipe that sends you to the stone age. Lastly Hall of the Bandit Lord can surprise hit someone with my commander if they leave them selves open. Most veteran players see this coming but even good players forget its out there. Akroma's Memorial is another haste giver but with evaision. A good Genesis Wave that lands you a bunch a creatures and Akroma's Memorial will in most cases win you the game on the spot. Alot of the time I win with this deck, I do it in an explosive fashion. By ramping really hard and getting the mana doublers out like Regal Behemoth and or Zendikar Resurgent drawing huge amounts of cards with cards like Rishkar's Expertise or garruk til I get Genesis Wave . Then cast Genesis Wave for an absurd amount of mana, getting like 20 things and Akroma's Memorial . and then casting some finisher like triumph of the hoards or Overwhelming Stampede to win with combat damage or infect. I put in Traverse the Outlands , this with my CMDR is huge! Put in Woodfall Primus for more removal something the deck needs. 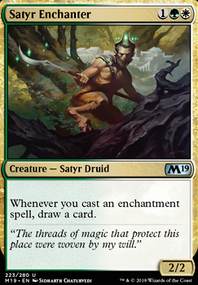 And put in Song of the Dryads great removal, great on CMDR's and on flavor with the deck. Thanks to Podma101, Profet93, and Qolorful for helping me make cuts.